Joints are movable connections between two bones. Each joint is made up of the surfaces of the bones involved, a joint cavity and a joint capsule. The joint surfaces (articular surfaces) of the bones are covered with a layer of cartilage. This layer is between 0.2 and 0.5 mm thick, and up to 6 mm thick on the kneecap. It provides a smooth surface to stop the bones in the joint from rubbing against each other too much. The cartilage passes the pressure in the joint on to the bone underneath it. This is especially important in joints that bear heavier loads, such as hip or knee joints. The surfaces of the joint are separated by a very thin space. The joint capsule seals the joint airtight from the outside. The space that results is called the joint cavity (or synovial cavity). The joint capsule has an inner and an outer layer. In the inner layer there are blood vessels and nerves. The nerves pass on information about what position the joint is in, and send pain signals to the brain. 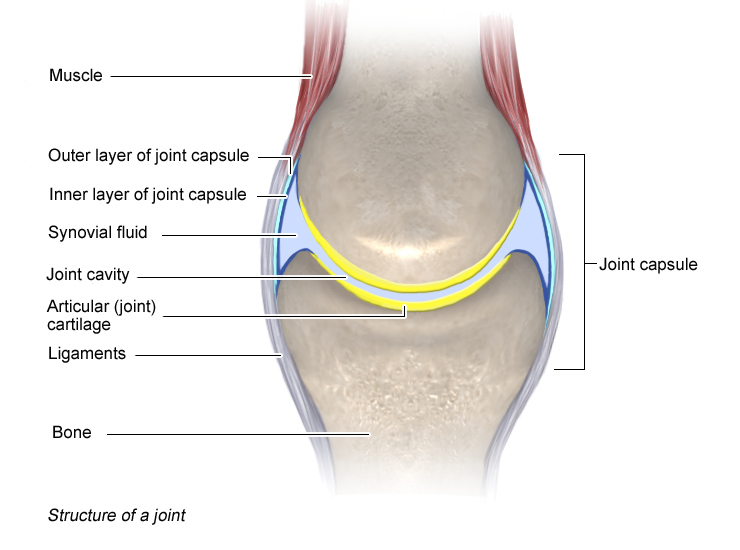 The outer layer of the joint capsule is made up of firm fibrous tissue. If a joint is immobilized (kept still) for a long period of time, these fibers may become shorter: The joint capsule shrinks and the joint is no longer as moveable. This is why it is important to do mobilizing exercises to keep moving joints after injury or when confined to bed for a longer time. Some joints have other structures inside of the joint cavity, such as the cruciate ligaments in the knee joint and cartilage discs like the meniscus in the knee joint. Other joints have a special shape. In the hip joint, for instance, the hip socket almost completely surrounds the top of the thigh bone (the femoral head). Cells of the inner joint capsule layer produce synovial fluid. This thick fluid nourishes the cartilage, makes sure that the surfaces of the joint glide smoothly over one another, and acts as a shock absorber by spreading out the pressure put on the joint. The direction a joint can move in is determined by the shape of the joint surfaces and the surrounding muscles or ligaments. How far a joint can be extended also depends on the muscles, soft tissue, ligaments or bones around it. For instance, the knee can only be bent up to a certain point because the back of the thigh and calf push against each other after that. Another example is the hip joint: Here the leg can only be moved backward up to a certain point because a fixed ligament in the groin stops it from moving any further. The flexibility of some joints can be improved by doing stretching exercises. Your overall flexibility is also determined by your build, age, level of fitness and other individual factors.